You’re welcome. And now on to 2015! Instead of resolutions, I’m trying for some goals. You may be getting quarterly updates on these. You know, just to keep me honest. Stockpile some posts. A lot of my blogging is done in real time. Nap time rolls around, I sit at the computer and share with you immediately. Sometimes this is fine, but it is not always ideal. Some topics I’d like to think about a little more. Sometimes we travel and I can’t write a post. I like to vary the content so you don’t get just kids or just food on any given week. This would all be easier to do if I built up some post reserves. The goal is to have some posts that I can choose from instead of feeling pressure to get a finished product out every day. Make the blog look prettier. You may have noticed some site updates. I am hoping to continue to upgrade. Until now, my goal has been content, content, content. I wanted to get on a regular posting schedule, and I generally have. Creating posts was more of a priority than having a slick-looking platform. Now I’d like to make the whole thing a little easier on the eyes and easier to use. Group blog content in a more helpful way. I’m working on creating a travel resources page. I’ll also try to work on other ways to organize content so that it may be of use to you. Read 4 books on writing. I’ve read Bird by Bird, but I really haven’t read much else on writing. I love to read. Getting through a book on writing each quarter should not be a hardship. Read more about blogging. I’ve been down a rabbit hole on Blog Tyrant over the last few days. There is so much I know nothing about. I’m sort of shocked that I figured out a “.com” way to blog. This goal is a bit loosey goosey, but I want to get better. Submit a piece of writing to another platform. The goal is not necessarily to have the writing published somewhere (something I can’t really control) or to be paid for writing. I just want to make myself send something somewhere. Potty train the toddler. He turns 3 this fall. I’m not pushing the potty agenda yet. I’ve heard that boys generally train later. But I’d love to cut down our diaper consumption at some point this year. Get the baby sleeping through the night. Mac generally still gets up once a night. Some mights it is closer to 6:00; not really complaining about those. Some nights it is more like 4:00 am. Not cool. I get that a lot of this goal is outside of my control, but I’d like to keep working on it. Get some childcare. I mentioned before that we’d like to get some baby parking for Henry a morning or two each week. Mostly because I think he will love it and it will be good to get some Italian language exposure. I’m not in a rush on Mac, but later this year I’d like to have some system for some kid-free time for me. It would be good to have some time to take a language class, exercise, do more writing, wander the city, etc. Be braver on morning outings. Up to now, we’ve stuck closer to home so that Mac could get a good morning nap in his crib. He still naps, but he is starting to be a little more of a pill about it. I think we may start to venture more far flung and Mac can nap on the go if he needs it. Morning adventure should get easier as it warms up this year. I’d like to get zoo annual passes, check out the children’s museum, get comfortable with the kids on public transportation, and more. Build exercise into my routine. My real goal is to lose the last few pounds from the last baby, but I’m trying to work on process goals instead of the end result. I still haven’t made exercise a priority, and I need to. The goal is to try to figure out a time when I can run and to make myself get up earlier for other exercise, like pilates. Build a paleo(ish) meal plan. I don’t mind repetition in food. We end up eating a lot of the same things anyway. My goal is to have a week or two of meals all planned out so that I can have a ready-to-go grocery list that will equal a meal game plan for the week. I say paleo-ish because I’m ok with some beans and cheese. If I get this one figured out, I’ll be sure to share! Cook for leftovers. I’ve written before that I struggle on making healthy and tasty lunches. Leftovers would really help on this front. For some reason, I struggle on making more for dinner the night before. I aim to fix this. I’m eying recipes for soups, frittatas, and slow cooker meals that should result in a better lunch than yogurt. Cut down on added sugar and gluten at home. If I can ever get the holiday sweets out of the house, I’m going to try to adhere to a “treats are for outside the house” mentality. Same for gluten. Pasta and pizza are OK for when we are out, but we will try to avoid at home. The Italians make better pasta and pizza than I ever could anyway. This goal will never reach 100% compliance, but I do want it to be the goal. 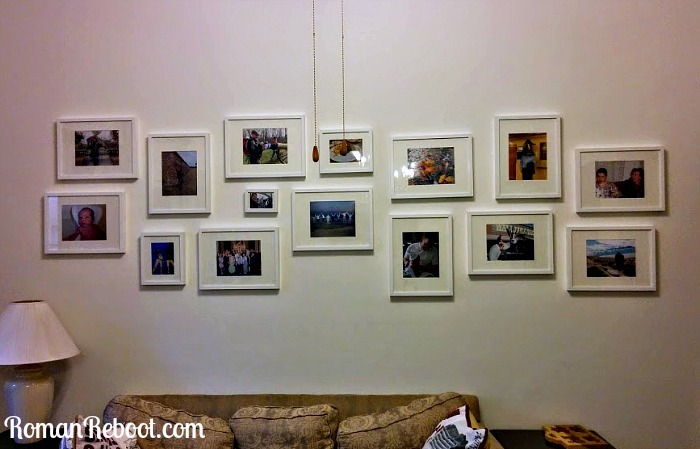 Hang up the rest of the pictures. The goal was to hang up everything before our friends visited at the end of the year. We have been making excellent progress, but a few left. Maybe can finish before my mom gets here next month? Make more time for email. Being away from people is hard. But in a way it has been good because I’m emailing with some people more than we got to talk when living in the same country. And then I drop the ball. Some days life just feels like kids and blog. I need to carve out time for my correspondence. Do a big trip each quarter. That list isn’t going to see itself. Tackle those neglected corners of the house. 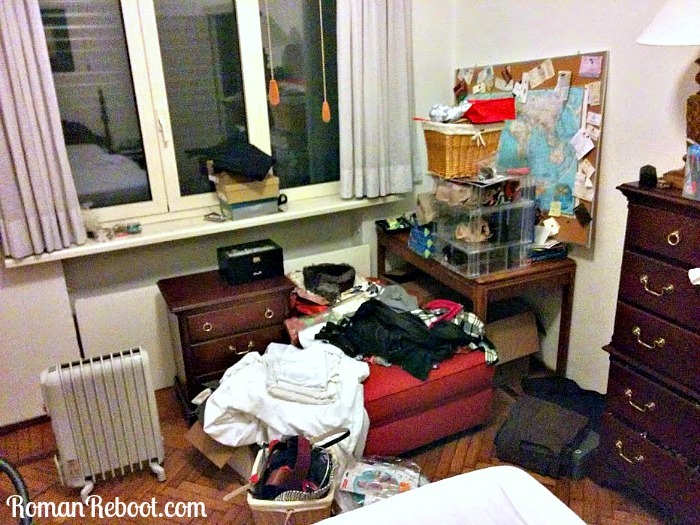 Most things are put away, but a few spots need some work. The corner of my bedroom where things go to die. Make a photo book for 2014. I actually need to make photo books for every year except 2007, but this seems like a more realistic goal. Well, that should keep me busy. Do you have goals? Resolutions? Resolutions still intact? How is it already Jan. 20! Don’t feel badly about the corner in your bedroom. I believe that every honest person will admit to having a corner just like that in the master bedroom. And I’m still trying to get motivated to finish two of the boys’ scrapbooks!